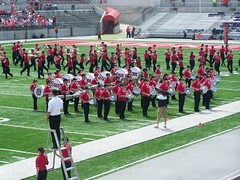 The Ohio State University team is facing 15 practice sessions coming up in the spring of 2012, starting on March 28. This includes the Life Sports Spring Game on April 21. The practice games will give head coach Urban Meyer and his coaches a chance to see how the team will play this year. He has six new assistant coaches and three that were held over from the past. Meyer took over the head position in January. The Ohio State Football spring game drills will kick off the 100th season since Ohio State joined the Western Conference. They became a part of the conference in 1912-13 but did not get to play until 1913. These practice sessions will provide the Buckeye players with the chance to get on the football field under their new head coach. Meyer does know how to build a championship team and win games. His .819 percentage of wins is in the top ten major college stats of all time. He has the second best record among the current guys who are coaching. In addition, he has the 2006 and 2008 national titles on his resume, dating from the time he was at the University of Florida. Senior fullback Zach Boren said, "Anyone who thinks the off-season training was tough is going to be really surprised at how much tougher the Ohio State spring football game sessions are going to be. You don't get even a second of down time. It's just all out playing on every play. Every player has to be willing to put it all on the line. You can't hold back here one bit." The returning 2011 team captain John Simon agrees with Boren. "It will be very intense here this spring. All the guys have gotten bigger and faster and even stronger over the off season. We are ready to get out there at the Ohio State spring football game. We want to have a chance to prove ourselves to the coaches. We want to show what we can do on offense, defense, and on the special teams". Meyer has been talking about how he is eager to get started. "I want to see what kind of presents I'm going to get at the Ohio State spring game on March 28th. I don't really know how things will look, but I can't wait to see how it all fits together. I made a decision not to look at any film from last year because I don't want to prejudge anyone. I want to start over with a clean slate."